Manitoba’s Urban Search and Rescue (USAR) team will wrap up their three-day training exercise at the old James Richardson International Airport terminal building today. The former airport terminal will be demolished and will become the exercise area, where the team will train for any and all emergency scenarios. The exercise is designed to be as realistic as possible, with volunteers called in from around the province. 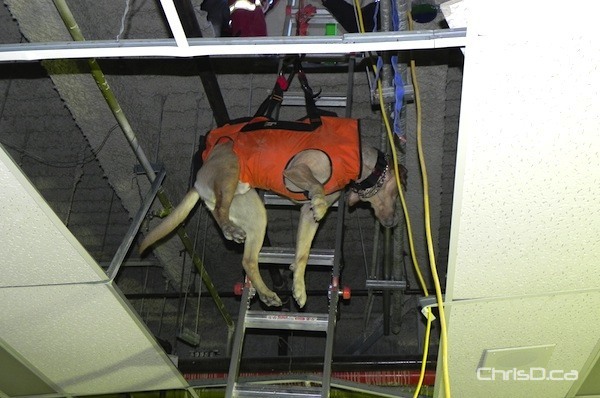 K-9 dog teams and specialized search equipment like cameras and listening devices have been put to the test as the team trains to locate trapped and buried people in a simulated rubble pile. All-season tents have been in place to house the USAR team, and water and galley supplies have been brought in. The camp also features an environmentally-friendly power system, computer-aided search tools and satellite communications systems.